The Library Staff wants to remind you to be considerate of your colleagues during the exam period. Please remember to hold quiet conversations in the vestibules and hallways, and to keep it to a minimum. Group study rooms are available for discussions. 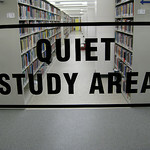 You can reserve group study rooms using the library’s online reservation system. Also, please do not bring food into the library. The smells are distracting to many students. Thank you and good luck on your finals.